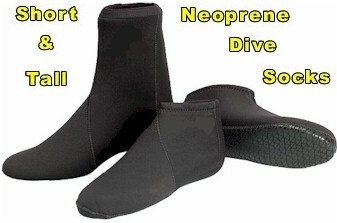 Our Short and Tall Dive Socks are made of Nylon II Neoprene with only two seams, and a rubberized grip pattern on bottom. 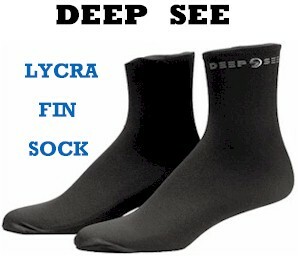 The Lycra Fin Sock from Deep See is lightweight, seamless and made of a soft, stretchy premium quality Lycra that provides a protective layer when using full foot or open heel snorkeling fins. One size fits all. SOLE: The new improved AKONA boot sole provides exceptional â€œno-slipâ€� grip texture. This new spike-like rubber sole features a deep cut pointed texture that drastically reduces hydroplaning across a boat deck, dock, sidewalk or floor. 30% thicker than the average vulcanized rubber sole, AKONAâ€™s new sole design provides comfort, stability and confidence while being worn before, during and after the dive. Men's sizes 5 through 13; ladies, order one size smaller than usual. 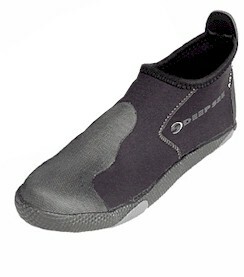 Material: Seeflex Nylon II Neoprene. Sole: Vulcanized rubber with puncture resistant "Safe Sole" layer and low profile grip pads. Upper: Two seams with toe & heel cap. Thickness: 3mm upper with 5mm innersole. Unique water purge at heel (patented). Pull-on style. Men's sizes 14-16. 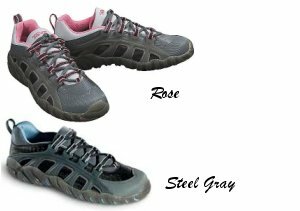 Self-bailing and super sticky, the Gamma sport shoe from Teva is about the coolest looking whitewater shoe around for women. Translucent crystal River RubberÂ® outsole holds steady in water and mixed terrain. Molded exoskeleton sports side panels made of ventilator screen mesh for continuous draining.